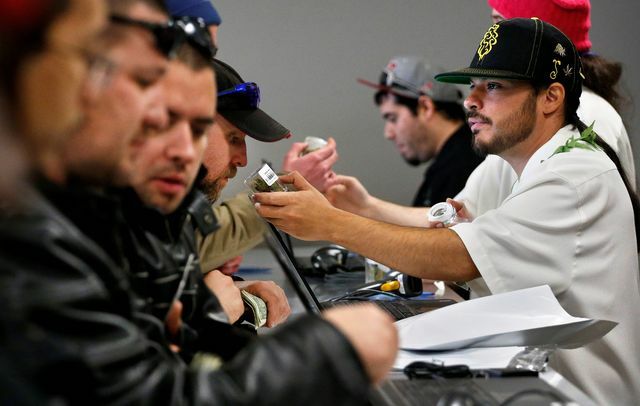 “Critics of legalized recreational pot predict other states will turn away after witnessing the unintended consequences of Colorado’s retail market, which they predict will include increased school truancy, addiction hospitalizations and high way fatalities. DENVER — Colorado lit up the nation’s first legal adult marijuana market shortly after dawn Wednesday, and Brandon Harris was not about to miss it. Mr. Harris and his friend Tyler Williams, both 24, drove 20 hours from Blanchester, Ohio, for the big opening. They arrived at the 3-D Cannabis Center at 2:50 a.m., which was good enough for 11th and 12th places on the store’s sign-in sheet. Was it worth it? “Definitely,” said Mr. Harris, who lined up outside with about 100 other customers as snow began to fall shortly before the 8 a.m. opening. In a legal and cultural experiment being closely — at times nervously — watched by states across the country, about 30 Colorado medical marijuana shops began selling recreational marijuana over the counter Wednesday, a little more than a year after voters approved Amendment 64, which allows retail pot sales to those 21 and older. Washington voters passed a similar measure in November 2012, but retail marijuana stores aren’t expected to open in that state until June. 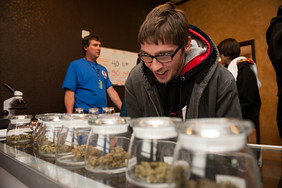 Colorado makes pot legal, ‘Rocky Mountain high’ jokes follow. Now watch the tragedies start piling up. Pot is always good for a giggle, and that makes it hard to take marijuana seriously. The news and entertainment media couldn’t resist puns on “Rocky Mountain high” when Colorado started the year with legal sales of marijuana for recreational purposes. TV stations across the country featured chuckling coverage of long lines outside Denver’s new state-licensed pot shops. Legalizing marijuana isn’t just amusing. It’s increasingly popular with legislators and the public. And why not? No matter how high stoners get, they’re nowhere near as scary as out-of-control boozers, right? Stoners don’t brawl in bars. They’re not into domestic violence. A Gallup poll last year found 58% of Americans favoring legalization (although other surveys report more slender majorities). Decriminalization of pot possession is widespread: 20 states sanction marijuana use for medical or quasi-medical reasons, and, following Colorado’s and Washington’s lead, proponents of legalization are targeting Alaska and Oregon for ballot initiatives in the near future, and six other states after that.